Proving superbly that Andy Murray does not have the current monopoly on rewriting tennis history, Johanna Konta claimed the biggest title of her career at the Miami Open to underline her credentials as a genuine contender to win a Grand Slam before too long. Caroline Wozniacki spent 67 weeks on top of the WTA rankings but for the majority of the biggest win of Konta’s career, the Dane was irrefutably second best. Winning 6-4 6-3 in just one hour and 35 minutes, the new world No 7 is now $1,175,505 (£950,000) better off, increasing her overall prize takings by a third. And her forceful game, allied to a calm mind, means Konta is now very much an opponent that her peers will fear. While Murray won the men’s title on the windswept Stadium Court of Key Biscayne’s Crandon Park in 2009 and again four years later, no British woman has ever raised the trophy in the event’s ­history that dates back to 1985. However this victory can seriously be classed as the most notable by a British woman since Virginia Wade won the Wimbledon title 40 years ago. 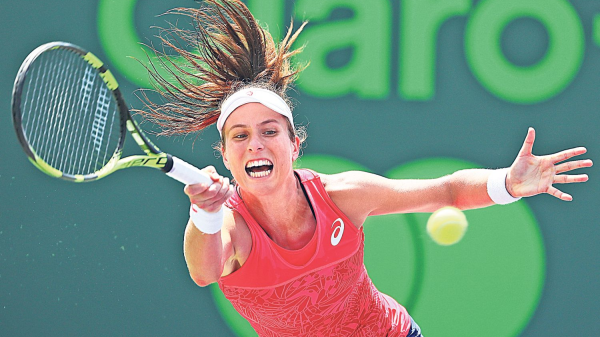 The Miami event is one of the four select Premier Mandatory competitions on the WTA circuit and as such rates ­secondary to only the four Grand Slams. Konta’s victory is even more ­extraordinary in that it was only the second time she had actually contested the tournament. Konta went into the final confident after beating the Dane 6-3 6-1 in the Australian Open’s third round just over two months ago. Wozniacki, who has never previously won the Miami title and had also lost her two previous titles this year in Doha and Dubai, added: “I’m now ­hoping third time lucky against Jo. We’ll play another time and I’ll try my best to win” In terms of big -match experience, this encounter was a miss-match. Although Wozniacki is just one year older, the Dane was playing in her 45th WTA final while Konta was contesting only her fourth. But there was not a trace of big-match nerves on the British player’s behalf as she walked on court and immediately laid down a marker by breaking serve in the opening game to love. The strength of Konta’s shots, particularly the serve and forehand, were the determinant factors. By contrast Wozniacki has never been able to hit the ball with as much pace as the likes of Simona Halep and Venus Williams, who had fallen to the British player earlier in the tournament. The reasons for Konta’s early dominance were simple. She had more time to play the ball and wasn’t being rushed. The measure of Wozniacki’s discomfort was demonstrated by her calling for some on-court coaching from her father Piotr after just three games. With temperatures rising to 100 degrees Fahrenheit, it was a day where fitness played a massive part and Wozniacki’s staying power is highly respected in the game. However Konta was simply too strong, taking the first set in 45 minutes and only taking slightly longer in the second set because Wozniacki required on-court treatment for pain in her right foot. Wozniacki was fighting but she didn’t really possess the weapons to do any real damage and long before the end, she simply seemed bereft of ideas. When it came down to the final game, Konta maintained the calm approach that has guided her from a place outside the world’s top 100 less than two years ago to become a top 10 player. She moved to match point with the most perfectly executed forehand pick-up off a good return and then rounded off the victory with the most sublimely executed lob.